So, I've been a little addicted to a game lately called Terraria, but I've had a hell of a time with the cloud saves. According to 505games they're aware of some issues that cause the cloud options to get corrupt and then no longer unplayable. So I've had to resort to just playing characters and worlds on my one device. Which is horrible for a guy like me who likes to hop device to device. Then, a recent update affected both my son's phone and mine (but yet not my tablet) where it wouldn't load up at all anymore. Usually in these circumstances a quick "clear cache/data" or uninstall/re-install would work wonders, and I know it would... however, I don't have a cloud backup of that character or world anymore. So I'd lose them. After losing the umpteenth combination already, I didn't want to do it again. So, I had to find out where the character and worlds were saved within the phone. Unfortunately it required me to have root access. Copy them to your backup folder you created in step 1. That's it. 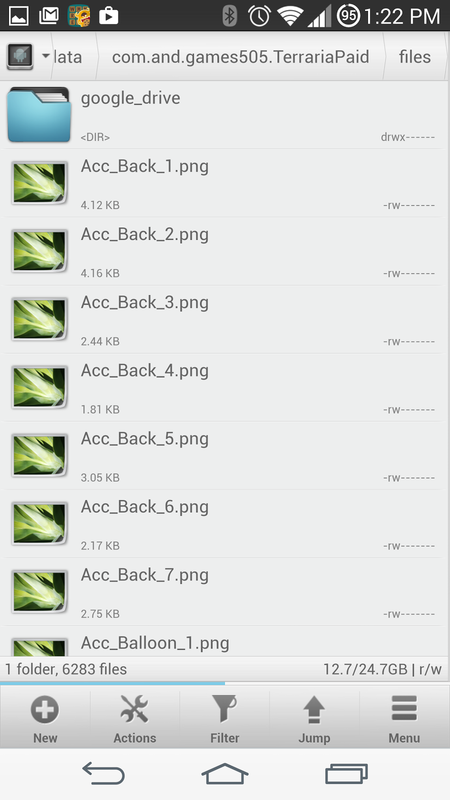 You could carry those to another device and just reverse the steps to load them into the game folder. I like using Solid Explorer as it can switch easily between 2 different folders by swiping left or right. Makes it really easy. For me, I just cleared data on the game, and then re-ran it and it worked fine (so something in the update failed and was corrupted... for shame 505games). I then threw the backed up characters into the games folder and they were back tickity-boo. Now, if someone could come up with a nice 'automated' way to do this for Terraria as they keep screwing it up themselves.